There may be a bit of a coverage gap along the I-95/295 corridor on the south side of the city and around Ellicott City (I’ll have to compare that to studio data before I make any sort of conclusions), but broadly speaking, it looks like a reasonably solid representation of the Baltimore region. Within the city, there is a north-south corridor within the city (Zip Codes 21201, 21202, 21218, 21211, 21212, 21239) that is represented, and the east-side/west-side are scattered at best. There is a lot of history that plays into maps that look like this…. 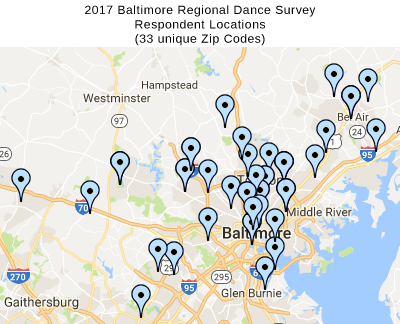 If anyone has suggestions about reaching into the gaps demonstrated above and finding the dancers that live there, I would very much like to hear from you.